Top » Catalog » Modifications » Do It Yourself » SSTWingLED Bookmark Us! Looking to add a new ship to your Stern Star Trek Pinball machine? 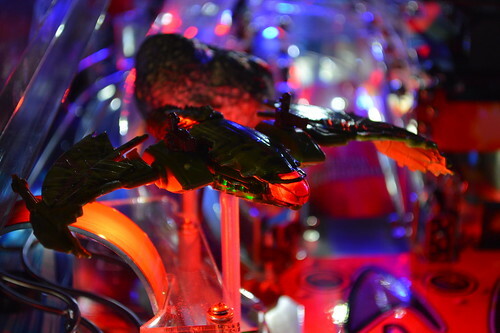 You can add the Hot Wheels JJAbrams' Star Trek Klingon Bird of Prey to your pinball machine but why not give it and your Playfield some LED lighting effects? This Do-It-Yourself kit provides all the circuitry to enable the ship effects seen below with power delivered from the Stern Star Trek's GI. Candle Flicker Yellow LED for rear engine. Revision 2 of this PBA set is now available. For Revision 2; we embedded the polarizer board into the main cockpit board removing the need for a separate board. No other changes were made to the board or LEDs. This kit should only take you about an 2-3hours to install. Notify me when "Stern KBOP WingLEDs" is re-stocked.